The down-and-dirty future of television is told in short bursts (20-second scenes, episodes that last minutes) that rely on whiz-bang production techniques (split screens, onscreen text) and are filmed vertically instead of horizontally. Bright background colors — like Snapchat yellow — attract viewers and sustain interest over a five-minute episode, the mobile equivalent of an hour of traditional viewing. A young actor with a bushy goatee, cast as a Satanist on a murder-mystery show called “Solve,” sat facing a camera on a stuffy, no-frills set in July. Six tenderfoot crew members stood sweating in the shadows nearby. One was staring at his iPhone’s stopwatch. It was no good. “Too long,” the iPhone guy said glumly. “That was 22 seconds.” Orders were given to redo the scene — preferably in an 18-second take. Perhaps try a “jittery” Satanist. This is the down-and-dirty future of television as practiced by Vertical Networks, a start-up founded by Elisabeth Murdoch, the media entrepreneur whose father is Rupert Murdoch. 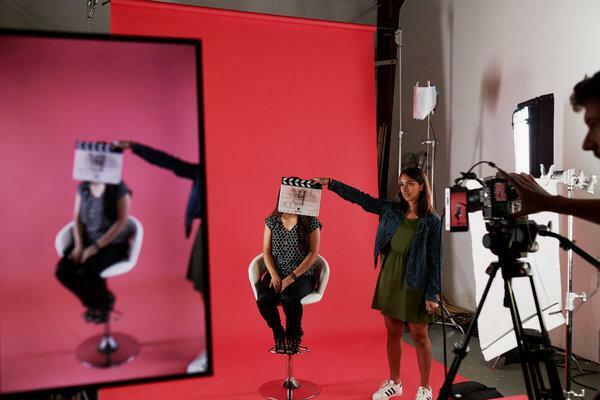 While her dad and brothers, Lachlan and James, have been busy selling the family’s old-line studios to the Walt Disney Company, she has quietly built Vertical into a major supplier of app-based video series for mobile devices. The stories are told in short bursts (20-second scenes, episodes that last mere minutes) that rely on whiz-bang production techniques (split screens, onscreen text) and are filmed vertically instead of horizontally: MTV for Generation Z. “I wanted a front-row seat in seeing this new world unfold,” Ms. Murdoch, 50, said in an email. “It’s harder than it looks. Great mobile video is unforgiving, labor-intensive and often counterintuitive to produce. By relying on research, Vertical has figured out how to engage teenage viewers on Snapchat, for instance, even as proven hit makers like WarnerMedia and Viacom have been slow to gain traction. Vertical-produced hits on Snapchat include “Phone Swap,” a dating show that allows participants to snoop through each other’s mobile devices and attracts an average of 10 million viewers per episode. “Solve,” which details a crime inspired by real events and then asks viewers to sort through potential suspects, debuted in May and draws a similar audience. Vertical, which counts Snap, the parent of Snapchat, as a minority investor, also makes shows for Facebook (“I Have a Secret”) and YouTube (“Yes Theory”). Vertical said its original content — including Brother, a digital magazine for young men that publishes daily on Snapchat and Facebook — attracts more than 50 million monthly active viewers. Ms. Murdoch’s start-up is profitable, a spokeswoman said, with ad sales contributing the bulk of its revenue. Nike, Intel and Warner Bros. are clients. As the traditional TV business has faltered, with younger audiences forgoing cable connections and broadcasters struggling to compete with Netflix, Hollywood has started to get serious about reaching the mobile masses. Disney is paying $71.3 billion for vast swaths of the Murdochian media empire to supercharge its app-based streaming plans. Ms. Murdoch declined to comment on the sale. Jeffrey Katzenberg, the DreamWorks Animation founder, said last month that his new venture, WndrCo, had secured $1 billion from investors that include Universal, Sony and Paramount to create high-quality, bite-size content intended for mobile viewing. Some conventional media companies, including NBCUniversal and Condé Nast, have found some success in this realm. So far, however, the winners in “mobile-first” original series have largely been scrappy start-ups like Vertical. With Vertical, Ms. Murdoch wanted to experiment. Could the upstart studio find novel ways to entertain 13-to-25-year-old users of apps like Snapchat — and spin off that content into traditional television shows, books and other media? She has reached a verdict after two years of stops and starts. “It looks like we can,” Ms. Murdoch said. of shows this year.) Fifteen “Phone Swap” episodes — lasting 30 minutes each, compared with about four minutes on Snapchat — ran on local Fox stations as a test for a full-blown syndicated series. The Fox Television Stations Group will decide whether to order more “Phone Swap” in mid-October, when it typically makes decisions about its summer test shows. Irreverent content succeeds on Snapchat, which has 188 million mostly young users. Ms. Rosser, who started her career at Google, described herself as “old.” She is 30. She joined Vertical two years ago and tracks the performance of the studio’s content across more than 100 variables to learn how viewers behave. What do they like? What keeps them most engaged? Mr. Wright and Jesús Chavez, who took over as chief executive this month, dismissed that criticism as jealousy and noted that they had several non-Fox television projects in the works. They emphasized that Vertical had been willing to fail. In one misfire, the studio tried to make a mobile show, “Epic Quit,” that involved people quitting their jobs in over-the-top ways. But no matter how much Vertical tweaked the series, viewers did not materialize. The studio ultimately decided that the mere idea of a job was a bore to Snapchat users.